Inground pool, A/C, nicely decorated large house, 4+BR, 3BA! Large fenced in back yard with great pool! 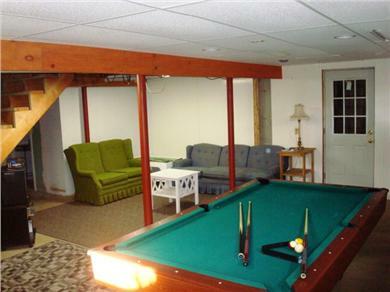 Pool table in the partially finished basement. Also a bathroom. Beach: 1.9 miles, and also the pool in the back yard! This home has all that you could want in a Vacation Rental property. We believe we have thought of everything! Lets start with the beautiful pool and the great back yard & deck. 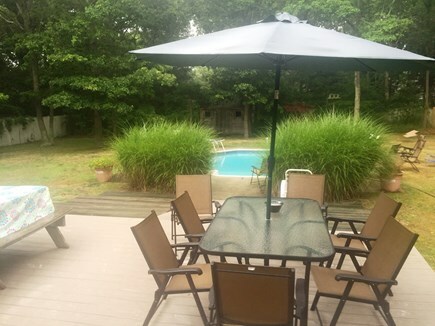 Plenty of lawn and deck furniture to enjoy your time poolside. The large gas grill is exactly what you need to make that perfect dinner under the stars. Please NOTE: We ONLY rent Friday to Friday in the summer! All four bedrooms have window A/C units! Our home is on a quiet dead end street surrounded by other very nice houses. 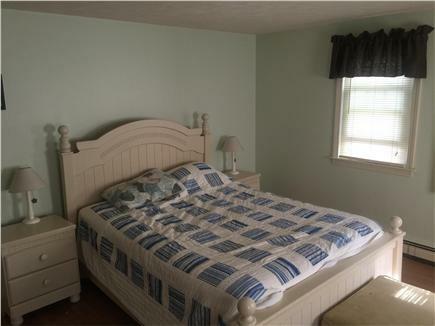 Two bedrooms on the first floor: Queen bed in one, two twins in the other. 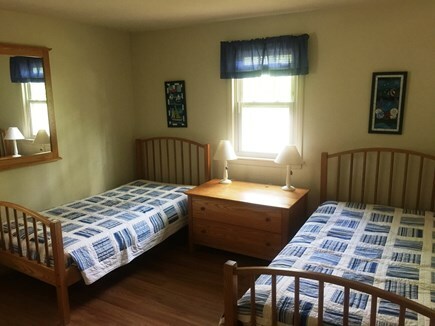 The two bedrooms upstairs EACH have a Queen and two twins. There are two living rooms, one on the main floor (with flat screen TV/DVD, birch hardwood floors, new couches & chair set from Jordans in 2016, quite nice! 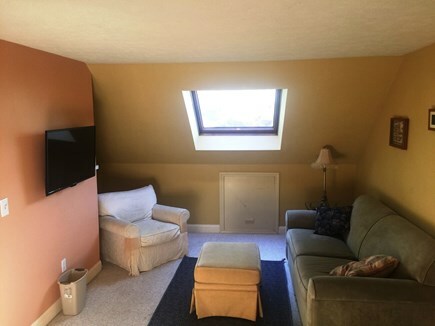 ), one on the second floor (couch, table & chair set & flatscreen TV with cable), and even a third 'living area' in the partially finished basement (also with couches, flatscreen TV) - there is also a full sized slate pool table in the basement! The bedroom on the main floor with a queen bed also has a flatscreen TV. The backyard is fully enclosed and quite large. The pool is a very cool octagon shape. Note that our pool does not have a 'deep end'. The whole pool, 25' across, has a maximum depth of about 5'. Because there is no deep end, it warms up quite nicely from the sun. The pool is open from about Memorial Day weekend to mid September, weather depending. Check with me for exact details if you wish to rent end of May or mid September. 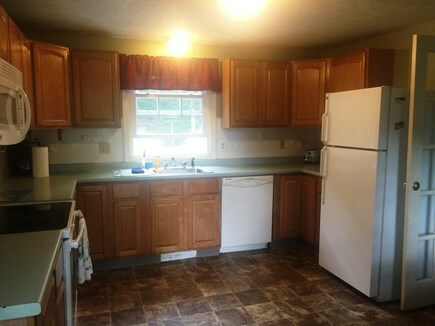 The kitchen is large, with newer appliances, including an electric stove, microwave, dishwasher and fridge. 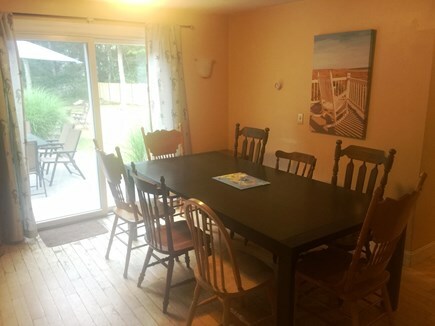 Plenty of counter space, and it opens up through french doors to the large dining area (set up with a new (Jordan's, 2016) large table, plenty of room and chairs for everyone! The main floor living room & the dining area open up, through a slider (with screen door, so you get nice breezes), to the over-sized deck (21' x 21', we replaced most of the decking with Trek in 2015 (fake wood that is so nice on the feet) which goes down to the in-ground, octagon (25' across) pool. Note that the pool has a maximum depth of about 5 1/2 feet - no diving allowed. Its a wonderful pool, we use it ourselves during turnovers or if the house isn't rented! There are 3 full bathrooms - one on each floor (including a full bathroom (shower only) in the partially finished basement. There is also an outdoor shower so you can clean up after a swim. There is also plenty of outdoor furniture, so you can eat under the stars! Also: a large gas grill is on the deck, and there is a washer/dryer in the basement. Families are welcome and will find the house to be very convenient! 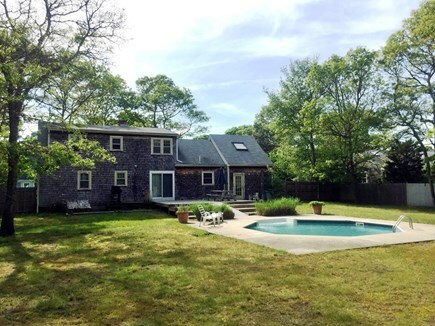 This home is great for a fun family (or group of friends) Cape Cod vacation. Falmouth is a very popular destination, for it's beaches, bike path, proximity to Woods Hole, easy access to off-Cape (day trips to Boston, Plymouth, Providence, Hyannis, Provincetown, more), and for easy access to Martha's Vineyard, as Falmouth has three ferries that run constantly to MV during the summer, making it an easy day trip. There are also many fine shops, restaurants, and pubs to add to the experience of your vacation. I've lived here most of my life, so please use me for recommendations! The house is between downtown Falmouth and Mashpee Commons, so there is plenty to do if there happens to be a rainy day. 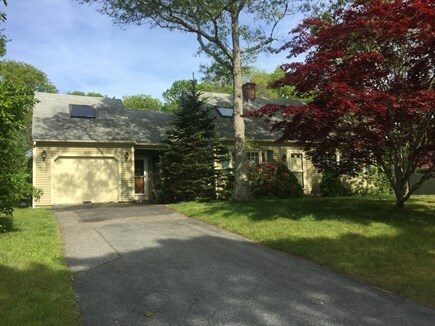 Nearby: 2 movie theaters (including a cinema pub, where you can eat/drink during the movie), many golf courses, excellent beaches, three different ferries to Martha's Vineyard from Falmouth, ferries to Nantucket (Nantucket Ferry is from Hyannis). Boston or Providence are only an hour fifteen minutes away, as is Provincetown! Plymouth, home of the Plymouth Rock and Plimouth Plantation, is 1/2 hour away. The hi speed internet is WiFi, connected through the Comcast Cable. This service is available for all rentals. There is no charge for this. It is password protected, we will give you the password when you check in. Linens and towels can be arranged for an additional fee, call or email for details. We will consider pets. Please call or email with details on your pet, and we can let you know. $100 additional charge for each pets. Pets we usually allow - small dogs, etc. We are not keen to let cats stay in the house. I live and work right in Falmouth, so I'm around if you have any issues during your stay. You won't see me during the week unless you need me though - as I have a professional lawn service mow, and a professional pool company maintain the pool. Nearest beach: 1.9 miles, and also the pool in the back yard! Long-Term Rental (1 month or more): available for long term 'winter' rentals! call or email for details. 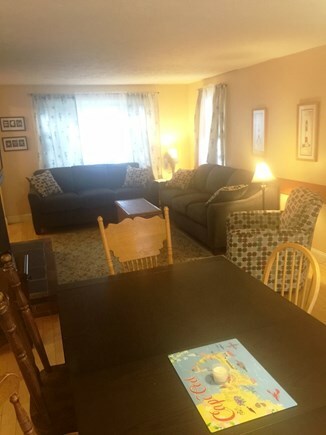 $900 to $1,000 per month (depending on # of people and length of rental), plus utilities. Additional pricing info: Take $100 off each week for multiple weeks! Last week August - get Labor Day weekend for free, State and local taxes of 12.45% will apply. there are 2 steps up into the house from the front, on the first floor are 2 bedrooms and a full bathroom. The bathroom has a tub/shower combo. The doorways are not wide enough for a wheelchair, sorry. We had a fabulous week. We found the home to be very clean and comfortable for our stay. We had all the amenities for our needs. 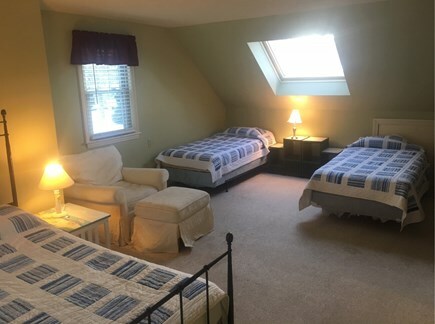 The location was close to downtown Falmouth and to the beaches but offered tranquility for when we just wanted to rest for the day. We would certainly stay here again! Great Stay for Memorial Day Weekend! A group of couples and friends stayed for Memorial Day Weekend. We had a lovely stay and had nothing but a great experience with the realtor. The house is quite spacious with lots of sleeping space. Beach just a short drive. The backyard is perfect, especially for those colder or windier days that you can't make it to the beach. Full working grille, nice pool, lots of yard space. We would definitely stay again! We celebrated my parents' 60 wedding anniversary on the Cape. We had family members attending from all over the United States. This rental was perfect for us. We held the celebration in the backyard. There was plenty of space and comfortable seating for all. We prepared and served a wonderful lobster feast with ease. The kitchen is roomy and well-equipped. The deck and pool area are accessible for people with limited mobility like my 85-year-old parents. Family members spent time by the pool, on the beach and on day trips to attractions all over the Cape. Falmouth is conveniently located and not too congested. The beaches are clean and beautiful. If you are a walker, there is a beach within a half hour walk - even shorter if you like to bike. Be aware that driving to the beach is problematic because you need a parking pass (available for $60 for the week). We solved that problem by driving people to the beach and then returning to pick them up when they were ready to leave. 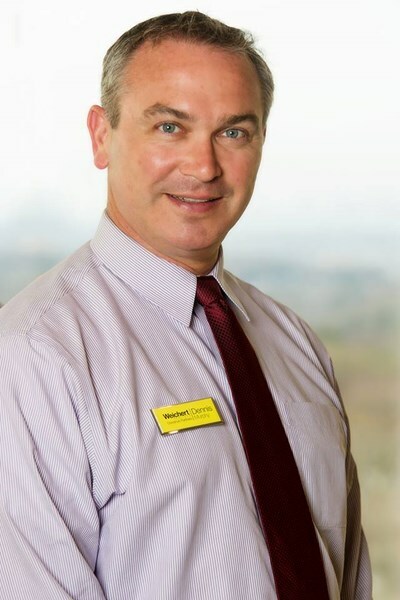 Dennis from Donahue Real Estate helped us to ensure that the vacation would be a success. He helped with everything from picking the right property for our needs to advising us on the best place to buy lobsters. My entire family of 10 vacationed here for a week and we really enjoyed it. The location of the house is very convenient - close to the beach and to shopping. There was plenty of comfortable space for all of us. The pool was a real treat, especially for the kids. And the owner was very responsive before and during our stay. We hope to return next summer for another family reunion! The entire experience of renting this property was a really smooth sail. The owner/Realtor was very helpful and responsive. The website described the property very accurately, the property was well-maintained, and it felt like a home away from home. The backyard deck and the swimming pool are a bliss for any summer morning or evening. 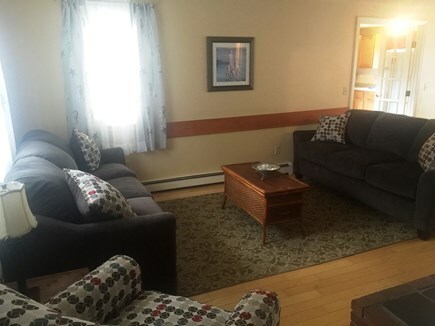 We really loved staying in this property and would like to rent it again whenever we go to Cape Cod." I have owned this home and others like it since the early 2000's. I live and work right in Falmouth, so I'm available if you need me, but besides Mondays when I pop in to check the chlorine levels, I don't come by the home unless requested or if there is a problem. People love to rent my home because of the pool and the location - walk to town, or the bike path! The huge back yard is also a big plus. Falmouth is amazing! so many public beaches, 3 ferries to Martha's Vineyard, World Famous Woods Hole, the Shining Sea Bike Path. And we are so central for exploring the whole Cape, or even Plymouth (1/2 hour), Boston (just over 1 hour), etc. Also, our Main Street has so many wonderful locally owned restaurants. I truly love our town, and am happy to recommend anything should you need it. We can also help with a catered clam bake!